Walking around an antiques store in a nearby village, I came across a selection of vinyl records and magazines. At the top of the display were old 1980s copies of “NME” magazine, still billed as “New Musical Express” on the cover. 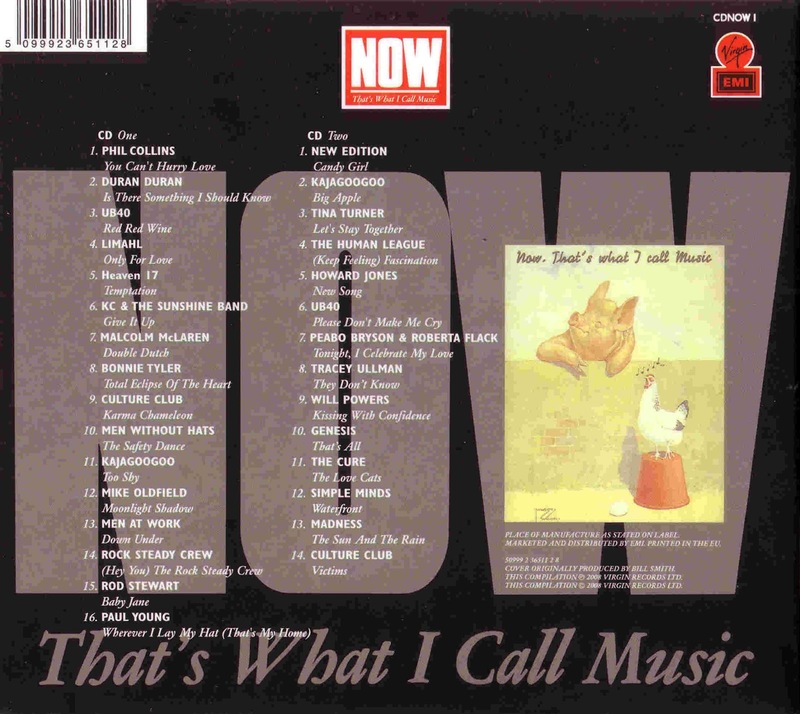 Working my way down, expecting another magazine, I struck gold: from 1983, I found the original “Now That’s What I call Music” album. The “Various Artists” compilation album was the preserve of cheaper labels like K-Tel or Ronco, or for when a record label wanted to round up the best of its own releases, like the “Motown Chartbusters” series. Instead, “Now” was the first collaboration between two labels, the biggest in the UK: Virgin Records, which originated the idea, and EMI, which also pressed and printed the records. If you bought “Now” when it came out on 28th November 1983 – it eventually spent five weeks at number 1 in the charts – chances are you went to either EMI’s record chain, HMV, or to Virgin Megastore. The name “Now That’s What I Call Music” came from an unlikely source, and one I thought had been randomly stuck to the back of the album sleeve: Richard Branson, Virgin’s founder, knew his cousin Simon Draper, managing director of Virgin Records, was grumpy before breakfast, and loved to have eggs in the morning, leading to Branson hanging a 1920s poster, used to advertise Danish bacon, behind Draper’s desk: under the caption, “Now, that’s what I call music,” a pig leans on a wall, listening to a clucking chicken, an egg lying in front of them. After listing the music labels that assisted Virgin and EMI – CBS, Epic, Charisma, Polygram, Capitol and so on – the kind permission is noted of Danish Agricultural Produces in allowing the poster to be used. 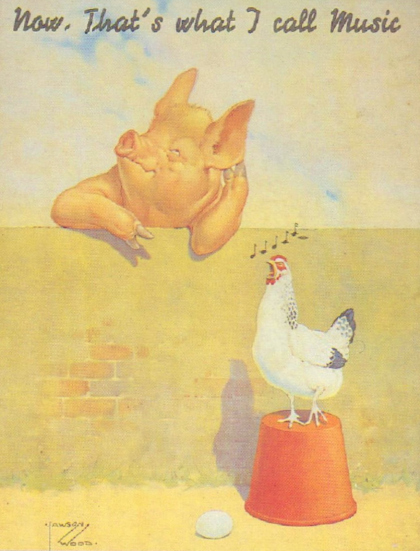 The pig acted as a mascot for the following four albums. 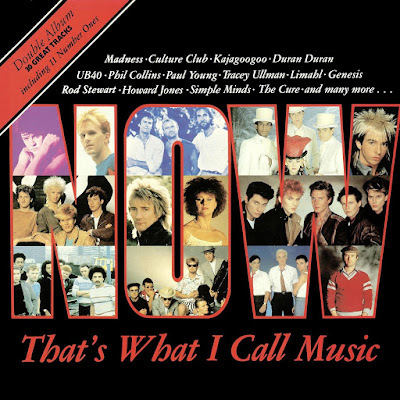 The first “Now” album has thirty songs, arranged roughly in order of release date, eleven of which (mostly from EMI) reached number 1 when released as singles – a note in the gatefold lists the only five other songs to reach the top of the charts in 1983. In some cases, like Madness’s “The Sun and the Rain,” you are told it had reached number 9 when the compilation was released, and “Victims,” by Culture Club is listed as, “almost certain No. 1 by the time you have this LP” – I am not planning to overwrite the “1” with a “3”. However, the album is redeemed by another choice, “just released at time of compilation,” which was “destined to be a smash hit” – “Let’s Stay Together” proved to be Tina Turner’s biggest hit to date. A wide range of musical styles are found on the album, ranging from New Romantic bands like Duran Duran, Human League and Culture Club, the big influencers at the time, to R&B, soul and rock groups, all down to including the hits – Bonnie Tyler’s “Total Eclipse of the Heart,” “Wherever I Lay My Hat” by Paul Young, “Down Under” by Men at Work, and New Edition’s “Candy Girl” are all here. A 2015 scientific study, by Queen Mary University London and Imperial College London, of 17,000 pop songs revealed that 1983 was an epochal year, as synth-based music became big in the United States, led by a procession of British bands – in the same year, both Eurythmics and Dexys Midnight Runners would have US number 1 songs. However, the same study also found that the accompanying drum machines and sampling led to more songs sounding similar by 1986, before hip-hop broke through by 1991. Some bands, or lead singers, do rather well on this album. In addition to “Victims,” Culture Club also feature with “Karma Chameleon,” the biggest-selling song of the year. UB40 also have two songs, “Please Don’t Make Me Cry” and “Red Red Wine.” Genesis features with “That’s All,” but a solo Phil Collins had the first number 1 of 1983, “You Can’t Hurry Love.” (Phil Collins also features twice on the front cover – once with Genesis, and once by himself.) However, “Now” had more faith in Kajagoogoo than most, including not just “Too Shy” and “Big Apple,” but also Limahl’s solo single, “Only For Love” – the band broke up in 1985, having already fired Limahl earlier in 1983, but have since reformed. Out of thirty singles, only seven come from artists outside the UK – apart from Tina Turner, you get Rock Steady Crew, with that one hit they had; “Safety Dance,” by the Canadian band Men Without Hats; and “Kissing with Confidence,” a disco novelty song, based around self-help guides, by “Will Powers,” with lyrics by an uncredited Carly Simon, who is pictured in the album with hand on hip, waiting for herself to write “Coming Around Again” and “Let the River Run.” The current Ofcom license for BBC Radios 1 and 2, the biggest stations in the UK, require 45% of the songs they play to come from UK artists, so seven songs out of thirty may have just been down to the available space on the records. I do have a record player, and “Now” sounded exactly as I expected – a bit quiet. The premium, heavier, 180-gram vinyl found more often today means you can cut deeper grooves into your record, allowing for a louder sound, and reduced surface noise. However, these records weigh 130g each, and in jamming up to eight songs onto each side, the grooves have to be packed more tightly, and cannot cut too deeply. 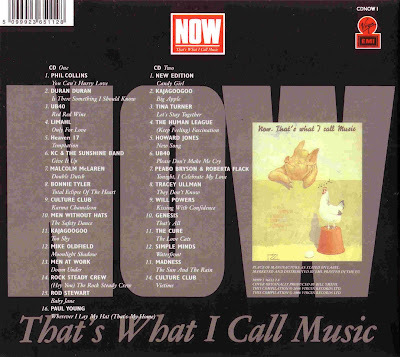 Strangely enough, the first “Now” album I ever bought, 1996’s “Now 35,” turned out to be the last released on vinyl – cassette sales ended with “Now 63” in 2006, digital downloads having started one album previously. 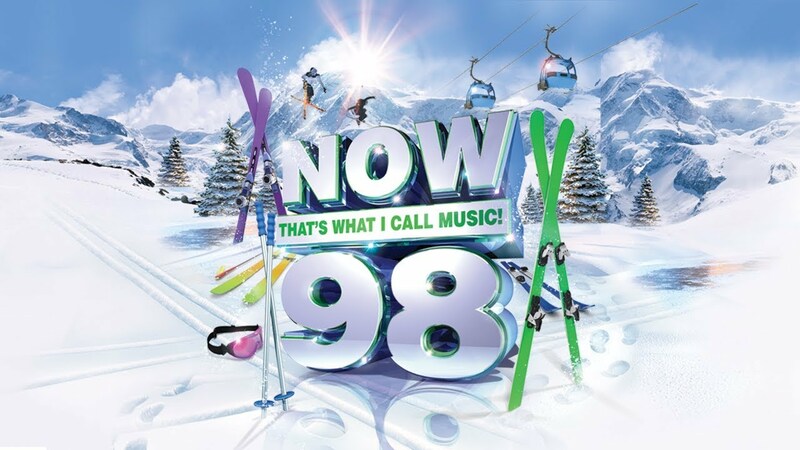 “Now 100” will be released around July 2018, cementing the series’ reputation as the hits compilation of record for the British charts, far outliving the labels that started it – EMI bought Virgin Records in 1992, but Universal Music, which joined the “Now” group in 1990, after ending their own competing series, bought EMI in 2013, with its music publishing arm being snapped up by Sony. Universal and Sony now run the show together, but give it another thirty years, and we may be saying something else again.